During an early fall trip to L.A., my lips took a serious beating because it was over 100 degrees for two days. In October! It was unseasonably hot and the earth felt scorched, as did my pucker. When I returned to the East Coast, the climate was chilly and dry, further battering my mouth. 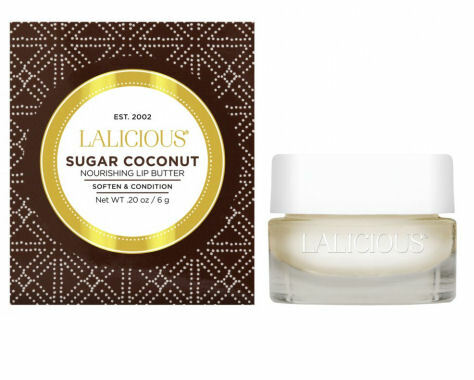 I needed instant and intense hydration and moisturization and I got it from Lalicious Nourishing Lip Butters. These little pots of awesome smell like a bakery, with extra yummy flavors like Sugar Coconut and Sugar Kiss. They are the perfect cold weather, daytime lip balm, since the sweet smells will give you a boost when you re-apply after hitting the wall around 2pm. I don’t recommend swiping them on your lips for deep, overnight conditioning, simply because the delish aroma might keep you awake, or, at the very least, dreaming about baked goods. You know the urban legend that lip balm is addictive? Yeah, these lip butters won’t do anything to dispel that notion, since I find myself slathering fingerfuls of the stuff on my pout all day, every day. Kiss Breast Cancer Goodbye…and More!